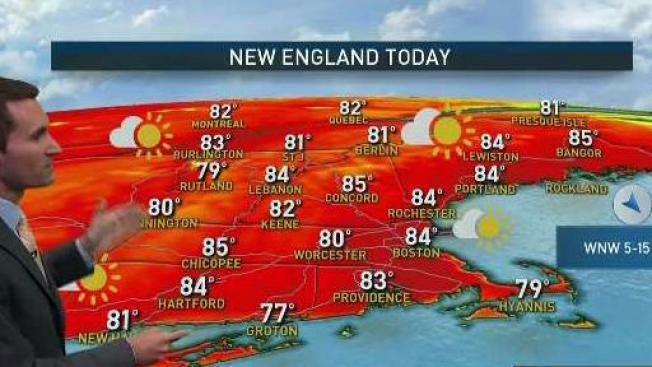 A beautiful weekend is now underway across New England. Plenty of sunshine on Saturday will boost temperatures into the 80s for most, with low humidity and a wind out of the west. Skies remain mostly clear overnight with lows in the 50s and 60s. Father’s Day will also boast lots of sunshine and highs in the 80s. A bit of a divide will set up though, with temperatures in the upper 80s to near 90 inland, and highs in the upper 70s to near 80 at the coast thanks to a slight onshore component of the wind. A cold front will approach the Canadian border late day, which may trigger an isolated shower or storm in far Northern New England. Otherwise it really is another great weather day. Humidity surges in on Monday with a gusty southwest wind. Temperatures will also spike into the 90s, approaching records in some cities and towns. That combination will make it feel more like 100 at times. The cold front will continue to creep closer, increasing the risk of spotty showers and storms, particularly north and west of Boston. On Tuesday the front will drop through Southern New England, increasing the risk of hit and miss storms there. Humidity and temperatures will also slowly drop Tuesday as the front slides by. More seasonable and refreshing air sets in mid-week.